Add the oil to a medium-sized saucepan and set on a high heat for 1 minute to warm up. Add the onion and fry for 2½ minutes, stirring regularly. Add the garlic, chilli and ginger and fry for 1½ minutes more. 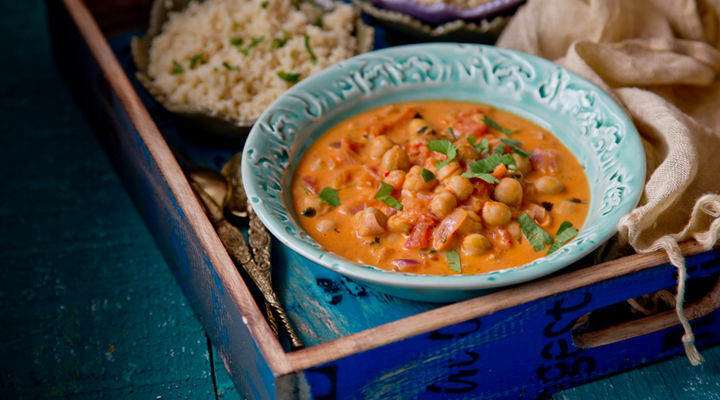 Add the spices and a pinch of salt and pepper and stir for 30 seconds, then add the tinned tomatoes, chickpeas and coconut milk. Bring to the boil, then reduce the heat and simmer for a few minutes. Finely chop the coriander, stalks included, and add to the pan along with the lime juice. Finally, taste and season with more salt and pepper if needed. Serve with some ripe avocado, couscous (which will be ready in 5 minutes) and/or some toasted whole wheat pitta cut into thin soldiers. Rice also goes great with this curry but needs more cooking time.